Welcome. I am so happy that you stopped by. We are having a break from all of the rain in Southern California. 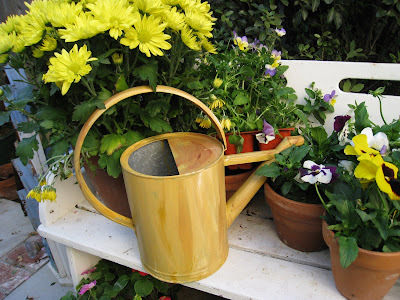 In spite of our unusually cold weather the sun is shining and the sky is blue - a perfect day for me to invite you to join me in my little garden to see what is blooming. I usually drink tea, however, when the weather is in the low 50's I like to make hot chocolate - I made a cup just for you. Looks like Bentley found a pot of Inpatients that survived the frost. 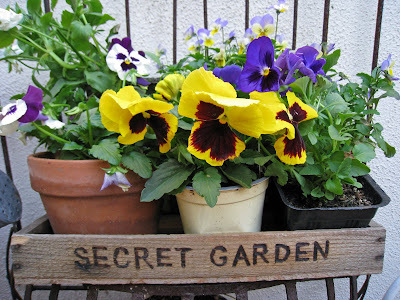 I planted Winter pansies last month and they are blooming in spite of the cold - they loved all of the rain. We plant them in the Winter as they do not do well in the Summer heat in Southern California. 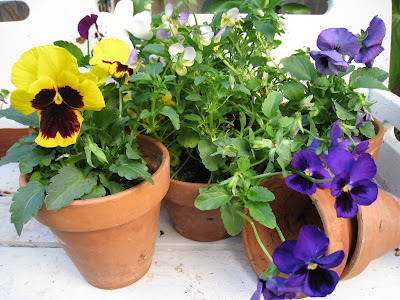 I love painting outside in " en Plein Air" (French word for in open air) and want to paint pansies in Terra cotta pots. Let's look for inspiration. Looks like Bentley, my helpful studio assistant, found some terra cotta pots. I ended up painting on a very small canvas since it was getting cold and the clouds started blowing in off the ocean. Looks like we are in for more welcome rain. Everyone hopes it will help end our bad drought. I hope those of you who are in really cold climates or snowed in enjoyed getting out with me enjoying the pansies. Thank you for visiting. I love hearing from you and sincerely appreciate everyone who visits me, leaves me a comment and follows my blog. Please leave me a comment if you would like to see me paint something special or have any questions. 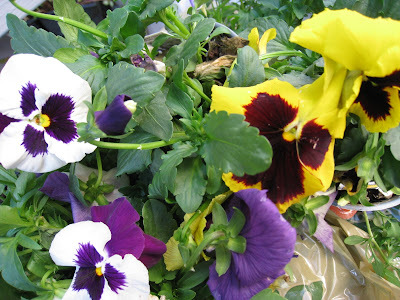 Pansies were my mother-in-laws favorite. I still have pansies sitting in the nursery trays as things were so hectic here, and they are blooming like crazy!! The next sunny day we get I'll plant them. We too have a definite end to our drought. So much rain, and today we are having ice instead of snow. Such crazy winter weather. Stay dry and enjoy your hot chocolate!!! Oh, over in Germany we had hot chocolate with chili pepper in it. Now that was hot! !, but good!!! I was searching garden blogs and found yours. Very nice. 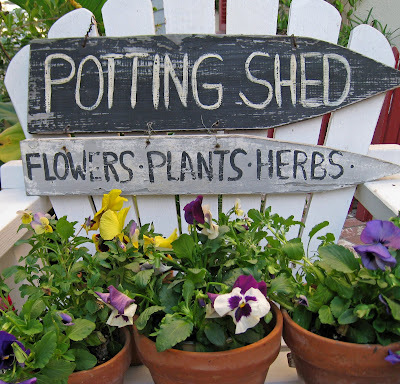 Love your garden/studio asst. Bently too. I'm adding you to my blog list. Love your pictures. Where did you get that beautiful yellow mug and saucer? Erin dear, I love your pansies - the growing ones and the painted ones! We have them in Winter thru Spring too, they die when the hot, humid days arrive. Such lovelies to add color to the Winter garden. Speaking of WINTER - if you stop by you can see our snow and how pretty the birds are right now. Thank-you Erin for helping Colette too! You are so kind. What beautiful picture. Thank-you for the inspiration, I sure do need it this year. What a lovely visit to your garden. The tea was perfect. I am delighted with your blog, and art work and photos. Do you sell notecards of your paintings and photos? I love to garden and to write notes. What a bright and cheerful tour. I enjoyed it very much. Please tell Bently thank you for letting us come along.